Milltown, Ga., June 23. – The business men of Milltown and the people generally throughout this section have come together and will, on the Fourth day of July celebrate Independence Day with a mammoth fish fry, free to everybody, who spends that day with us. It is the intention to have something like 2,000 pounds of fried fresh water fish here that day, besides other eatables. The present prospect is that there will be at least 5,000 here on that occasion. In addition to the free fish fry, there will be a ball game between Milltown and Homerville, boat races, foot races, and other interesting sports. The boat races will take place on Lake Irma, an artificial body of water right in the center of town, covering about 12 acres. On the bank of this beautiful lake is a skating rink, where a contest in fancy skating will occur. The Waycross and Western railroad will run an excursion from Waycross and the Milltown Air Line one from Naylor, where it connects with the Atlantic Coast Line. Word comes that every available automobile in Valdosta, Hahira, Nashville, Adel, Sparks, Rays Mill and other nearby towns have been engaged to bring the crowds to Milltown on the glorious Fourth. This is claimed to be the greatest fish fry in the history of all time, except one. Milltown is in the very heart of the finest fishing territory in the whole south. Only one mile away is the famous Bank’s Pond, covering 11,000 acres of land and abounding in the choicest and gamest of fish. 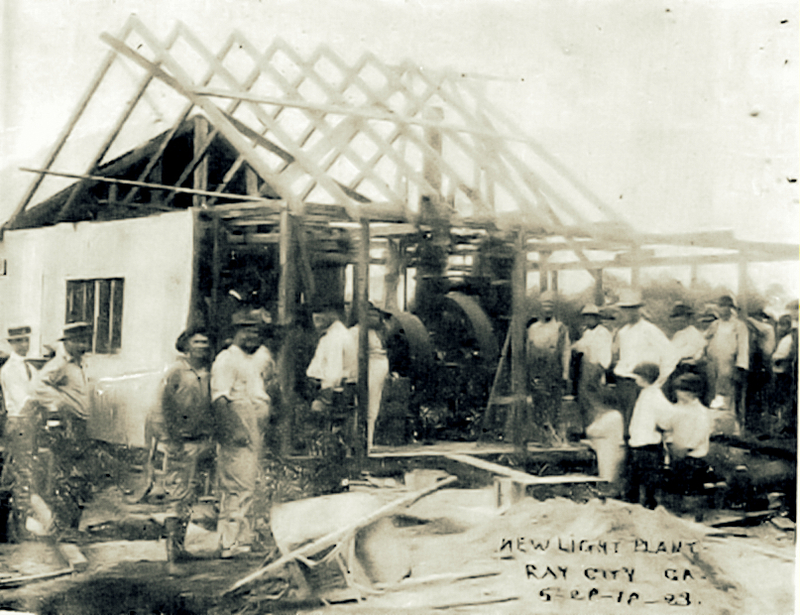 Ray City Light Plant – September 18, 1923. Bruner Shaw was among those present at the start-up of the power plant. In the 1920’s the cities and towns of south Georgia were all working to bring electricity to homes and businesses. In fact, in the first six months of 1922, Georgia ranked 4th among all states east of the Mississippi in hydroelectric power production. At that time, 87% of all electricity generated in Georgia came from hydroelectric power. In Ray City, though, the people still relied on kerosene lamps or gas light. In 1922, Milltown, GA (now known as Lakeland, GA,) began work on a one-thousand horsepower hydroelectric plant. The plant was expected to supply enough electric current for Milltown, Valdosta, and for other area towns including Ray City, GA.
Milltown, Ga., March 12. –(Special.) — The town council has purchased water meters and light meters and as soon as they arrive they will be installed. F.E. Hatch, of Albany, will begin work in a few weeks on the hydroelectric plant. He has been delayed by not securing right of way from some parties. The plant is to be located on Lake Irma with water piped from Burk’s Pond, a mile away. The plant will cost about $350,000. A thousand horsepower will be generated by the plant, current enough to supply cheap power for Milltown, Valdosta, Ray City, Adel, Sparks, Nashville, Ocilla and other towns. Ray City wasn’t waiting for power to be run from another town, though. Funds were appropriated in sufficient amount, it was thought, to complete the construction of a municipal waterworks and power plant in Ray City, and a contract was let. Milltown, Ga., July 21. –(Special.) Ray City is soon to have electric lights and waterworks. Mayor L. F. Giddens has closed the contract with McGraw & Co., of Thomasville, to put in the plant. All material is bought and expected any day. Work has begun on wiring the homes, and this part of the work will be completed by August 1. The contract also has been let for boring a well near the dam, and the city will be piped as soon as possible, to give the people both electric lights and waterworks. They will own their own hydro-electric plant. Bonds have been sold to take care of the expense. But the construction of the electric plant at Ray City didn’t progress well. The water quality from the deep well was bad, and the dam for the hydroelectric plant needed repairs before it was even completed. By the end of October there was still no power or water service in the city. Ray City, Ga., October 27. –(Special.) — The deep well at Ray City has struck a vein of sulphur water. The pipes have been laid and are being connected. Citizens expect to have water in their homes in a few more days. The dam at Beaverdam Pond is being repaired and in the course of a few weeks, the wiring having already been done, Ray City will be equipped with electric lights. But for electrification, things got worse instead of better. Attempts to repair the dam failed, and when the dam finally broke the project was off schedule and hopelessly over budget. A year later the dream of cheap hydroelectric power in Ray City was running out. In the meantime the city was running a kerosene fueled motor to drive the electric generator. It would take another bond issue to continue the project, and the people of Ray City put it to the vote. The election at Ray City to float additional bonds, $5000 for school purposes and $7000 for water and lights, was carried 64 for and 4 against. The Annual Report of the State of Georgia for 1922 reported Ray City had a deep well at 255 feet; by 1924 the bacteriological condition of the water was still untested. Milltown, Ga., November 10 –(Special.) — The election at Ray City to float additional bonds, $5,000 for school purposes, and $7,000 for water and lights was carried 64 for and 4 against. Several years ago Ray City floated bonds sufficient, it was thought, to build a new school building, but building expenses exhausted the funds and left the building incomplete. As soon as the new bonds are sold, the work on the building will be completed and Ray City will have one of the best modern school buildings in the state. It was also thought that sufficient funds were appropriated to put in a waterworks and electric light plant. But these funds gave out before the work was what they wanted. There is a hydroelectric plant. The dam was broken some time ago and the light is furnished now by a powerful kerosene engine. The funds to be raised by these additional bonds is for the completion of this work. On January 5, 1928 the Georgia Power & Light Company purchased the Ray City Electric plant, for the sum of $3,816. On Beaverdam Creek, just east of the Pauline Street bridge, are the concrete remains of the Ray City hydroelectric dam. Nearby, the remnants of a mechanical shed remain. The old Ray City water tower was torn down and sold for scrap a few years ago.